정공청 장군이 임진왜란(1592) 당시 의병장으로 활약하면서 착용했던 투구와 갑옷, 장갑, 혁대, 화살 등의 유품이다. 정공청 장군은 임진왜란이 일어나자 아들과 함께 전쟁에 참가하여 울산, 서생포, 기장 등지에서 백여배에 달하는 왜군들과 싸워 수적인 열세에도 불구하고 커다란 공을 세웠으며 이 때문에 그는 1등, 그의 아들은 2등 공신에 책봉되었다. 현재 그의 유물들은 후손인 정철환이 국립경주박물관에 위탁하여 보관하고 있는데 그 내용은 다음과 같다. 위가 좁고 아래가 넓은 원(圓)모양의 철로 만든 투구는 부식이 심한 상태이지만 원래 모습을 추측할 수 있다. 정면에는 앞쪽으로 3㎝, 길이로 17㎝ 정도의 해가리개를 양끝과 가운데 못을 박아 달았고, 목가리개가 있던 흔적이 남아있다. 이것은『세종실록』중 ‘오례(五禮) ’중에 나오는 병기(兵器)가운데 원두(圓兜)와 비슷한 모습이다. 갑옷은 남자들의 겉옷인 포(袍)의 형태를 하고 있다. 겉은 화려한 초록색이고 안은 명주인데 천 사이에 2㎝ 간격으로 누빈 2겹의 무명천이 들어 있다. 앞쪽에는 옷을 여밀 수 있도록 매듭으로 만든 4개의 단추가 있으며 어깨에는 중앙에 가운데가 꺾일 수 있도록 경첩장식을 달아 팔의 움직임을 자유롭게 하였다. 옷의 위와 아래에는 놋쇠로 만든 못을 박았고 목둘레와 소매끝, 아래단에는 가죽으로 단을 대었다. 정장군의 유품가운데 특히 주목할 만한 것은 오늘날의 것과 모습이 거의 같은 장갑이다. 부드러운 가죽으로 만든 것으로 활을 쏠때 낀 것으로 보이며 엄지손가락에는 뿔로 만든 깍지가 붙어 있다. 그밖에 가죽으로 만든 길이 80㎝, 125㎝의 혁대와 일본도와 비슷한 너비 3.5㎝, 길이 85㎝의 철제로 만든 도검(刀劍), 6개의 화살 등이 남아 있다. 이 유물들은 임진왜란 당시의 것으로 복식사를 연구하는데 귀중한 자료로서 높은 평가 받고 있다. 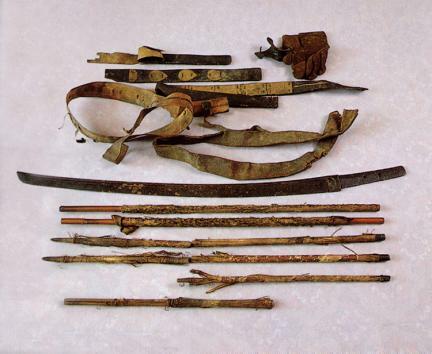 These are the relics of General Jeong Gong-cheong, which were worn during the Japanese Invasion of Korea in 1592. He and his son participated in the war and rendered meritorious services in battlefields such as Ulsan, Seosaengpo, and Gijang, fighting against some 100 vessels of the Japanese army. After their bravery was recognized by the King, they were installed respectable retainers. At present, his artifacts are kept at the Gyeongju National Museum after his descendant Jeong Cheol-hwan entrusted them to the museum. 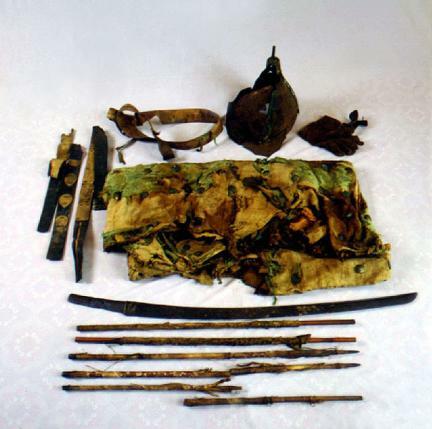 The artifacts include helmet, armor, a pair of gloves, a leather belt, and arrows. The steel helmet has a narrow top and a wide, round bottom. Although badly rusted, its original shape is recognizable. A 3cm wide, 17cm long sun-cover is nailed on both ends and the middle of the front, with a trace of a neck cover. It is similar to the wondu (round helmet) recorded in Sejong sillok (Annals of King Sejong). The armor resembles the shape of po (men’s coat). The outer side is bright green, and its lining is made of silk. There is a two-fold quilted cotton cloth between them. Four knot-buttons in front enable adjustment, with the hinged ornament whose middle part could be folded on the shoulders ensuring comfortable arm movement. Brass nails were riveted at the top and bottom of the clothes, and leather was added to the hem of the neck, sleeves, and bottom. A notable artifact is his gloves, which look similar to those of the present time. The gloves are made of soft leather, and they seem to have been worn when he shot arrows. A horn ring is attached to the gloves to insert the thumb. There are leather belts 80 cm and 125 cm long. An iron sword found measures 3.5 cm wide and 85 cm long and looks similar to Japanese swords. In addition, 6 arrows remain. The artifacts are deemed valuable in studying clothes during the Japanese Invasion.